Opa-locka is a city located in Miami-Dade County, Florida, United States. As of the 2010 U.S. Census, the population was 15,219. The city was developed by Glenn Curtiss. 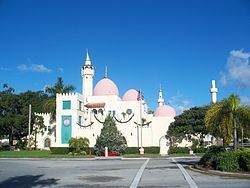 Developed based on a One Thousand and One Nights theme, Opa-locka has the largest collection of Moorish Revival architecture in the Western Hemisphere, and streets with such names as Sabur Lane, Sultan Avenue, Ali Baba Avenue, Perviz Avenue, and Sesame Street. Opa-locka has an area of 4.2 square miles (11 km2) and is located in the northeastern area of Miami-Dade County, Florida. The name Opa-locka is an abbreviation of a Seminole place name, spelled Opa-tisha-wocka-locka. The original name probably signified a wooded hammock in a swamp. Opa-locka was founded by aviation pioneer Glenn Curtiss in 1926. Curtiss developed the city with a Moorish architecture theme. While the 1926 Miami hurricane badly damaged the city and brought the Florida land boom to a halt, several Moorish-style buildings survived. Twenty of the original Moorish Revival architecture buildings have been listed on the National Register of Historic Places as part of the Opa-locka Thematic Resource Area. Amelia Earhart launched her historic trip around the world from Miami Municipal Airport, just south of Opa-locka. The famous German dirigible Graf Zeppelin visited Naval Air Station Miami, which later became Opa-locka Airport, as a regular stop on its Germany-Brazil-United States-Germany scheduled route. In the 1950s, the airport - specifically Building 67 - became the site of a large CIA operation, PBSUCCESS, run by operatives including E. Howard Hunt. The operation helped launch the U.S.-led coup in Guatemala in 1954 and was a precursor to the Bay of Pigs Invasion in 1961. The airfield center then served as a listening post for Cuba until the 82nd Airborne took over Opa-locka Airbase during the Cuban Missile Crisis. The city was the first community in the United States to commemorate the first African-American President of the United States. A mile-long section of Perviz Avenue — from Oriental Boulevard to Ali Baba Avenue — was renamed Barack Obama Avenue on February 17, 2009. In addition to the unique buildings, Opa-locka has a large general aviation airport, three parks, two lakes and a railroad station which is currently the tri-rail station. The city is a mixture of residential, commercial and industrial zones. The city was the backdrop for the making of movies such as "Living Dreams", Texas Justice, Bad Boys II and 2 Fast 2 Furious. The Opa-Locka City Commission had met on the same day, requesting that the governor declare the financial emergency. The state and the City of Opa-Locka were to execute a State and Local Agreement of Cooperation, which binds the city's actions. The government would appoint a Financial Emergency Board. On the same day, the Miami Herald reported that "Millions of dollars are in arrears as the city teeters on the edge of bankruptcy" and "City officials remain under an FBI corruption investigation" The article also reported that this financial emergency was the second declared for the city since 2002. Just over a week earlier, Opa-Locka Commissioner Terence Pinder apparently drove his SUV into a tree at high speed, which killed him. He was scheduled to turn himself over to prosecutors the next day, having faced bribery charges. Opa-locka is located at 25°54′04″N 80°15′03″W﻿ / ﻿25.901218°N 80.250824°W﻿ / 25.901218; -80.250824. According to the United States Census Bureau, the city has a total area of 4.5 square miles (12 km2). 4.3 square miles (11 km2) of it are land and 0.1 square miles (0.26 km2) of it (3.13%) is covered by water. As of 2010, there were 5,966 households out of which 14.8% were vacant. In 2000, 41.2% had children under the age of 18 living with them, 28.4% were married couples living together, 35.2% had a female householder with no husband present, and 29.7% were non-families. 24.8% of all households were made up of individuals and 8.5% had someone living alone who was 65 years of age or older. The average household size was 2.97 and the average family size was 3.52. In 2000, the city's population was distributed as 34.6% under the age of 18, 12.3% from 18 to 24, 26.8% from 25 to 44, 17.7% from 45 to 64, and 8.5% who were 65 years of age or older. The median age was 27 years. For every 100 females, there were 85.6 males. For every 100 females age 18 and over, there were 77.1 males. In 2000, $25,000 was the median income for a family. Males had a median income of $22,347 versus $19,270 for females. The per capita income for the city is approximately $15,000. About 31.5% of families and 35.2% of the population are below the poverty line, including 42.3% of those under age 18 and 40.8% of those age 65 or over. As of 2000, speakers of English as a first language accounted for 68.45%, while Spanish made up 28.30%, French Creole 2.78%, and French was at 0.48% of the population. As of 2000, Opa-locka had the 46th-highest percentage of Cuban residents in the US, with 9.58% of its populace. It had the forty-ninth highest percentage of Dominican residents in the US, at 2.59% of the city's population, and the fifty-second highest percentage of Haitian residents in the US, at 2.90% of the its population (tied with four other areas, including Palm Springs, Florida). It also had the forty-third most Jamaicans in the US, at 3.00% (tied with Margate,) while it had the nineteenth highest percentage of Nicaraguans, at 2.22% of all residents. The city of Opa-locka was incorporated in 1926 and operates under a commission/city manager form of government. The city commission consists of the mayor and four commissioners, who are responsible for enacting ordinances, resolutions and regulations governing the city; and appointing the members of various advisory boards, the city manager, city attorney and city clerk. As chief administrative officer, the city manager is responsible for the enforcement of laws and ordinances, and the appointment and supervision of the city's department heads. Municipal services include police, sanitation, water and sewer services, storm water services, maintenance of streets and infrastructure, and recreational activities. The financial reporting entity, under which the financial statements are prepared, includes all the activities and functions for which the city is financially accountable. The federal government has been investigating the city's government since at least 2013. In 2014, auditors reported that basic bookkeeping was non-existent. The Miami Herald reported the mayor and other officials were using city funds for their own benefit. In 2016, the city manager and public works supervisor were arrested, charged with extortion of money in exchange for city permits. Both quickly pled guilty. The city's water system had been used by city workers as means of collecting money for their own use. In August, 2016 the city asked the county to take over the system. In 2004, Opa-locka had the highest rate of violent crime for any city in the United States. Calvin Godfrey wrote, in a 2009 Miami New Times article, that Opa-locka was "mired in crime and sinking fast." In a 2013 editorial, the Miami Herald called the city "crime-plagued" and the police department "deeply troubled." Calvin Godfrey wrote in the Miami New Times that the police department, whose headcount had decreased from 50 to 16, had been "steadily deteriorating" for the 20-year period leading up to 2009. The Miami New Times received memorandums that, in Godfrey's words, "reveal an agency rife with controversy." In January 2005, after negative Florida Department of Law Enforcement evaluations of the Opa-locka police force surfaced, the Miami-Dade Police Department sent county commissioner Barbara Jordan a report that projected it would cost $7 million per period to take over the Opa-locka police duties. In 2005, Opa-locka allocated $3.5 million to its officers. Jannie Beverly, Opa-locka's city manager, fired the police chief in January 2008 after he had been accused of corruption. According to press reports in late 2011, local officer German Bosque led the state in the number of complaints and internal investigations of his activities. In 18 years, he had been the subject of 40 internal investigations, 16 for excessive force. During his career he had been fired five times and arrested three times. Opa-locka crime statistics report an overall downward trend in crime based on data from 12 years, with both violent crime and property crime decreasing. Based on this trend, the crime rate in Opa-locka for 2013 was expected to be lower than in 2010. Miami-Dade County Public Schools serves Opa-locka. Dr. Robert B. Ingram/Opa-locka Elementary School is located in Opa-locka. North Dade Middle School in Miami Gardens and Hialeah/Miami Lakes Senior High in Hialeah serve the city. The Opa-locka Branch library is one of the 49 branches included within the Miami-Dade Public Library System. This branch is open to the public on weekdays offering an After School Club and Storytime for children. Opa-locka had 30 houses of worship in 1996. During that year, Oscar Musibay of the Miami New Times said, "Like South Beach has hotels, Opa-locka has churches." Opa-locka is served by Opa-locka Executive Airport, owned and operated by the Miami-Dade County Aviation Department. Additionally, Opa-locka is served by Miami-Dade Transit buses and by Tri-Rail via the Opa-locka Station. Opa-locka is featured in the landmark 1969 documentary film Salesman, by the Maysles Brothers. In 1970, Mary Ann Vecchio a teenaged runaway from Opa-locka, was in Kent, Ohio, on the day of the Kent State shootings on May 4, 1970. The image of Vecchio, kneeling by the body of a slain Kent State student, taken by Pittsburgh Tribune-Review freelancer John Filo, later won a Pulitzer Prize. In the 1991 film Soapdish, the leading character, played by Kevin Kline, is a down-and-out actor reduced to drunkenly performing the role of Willy Loman in Death of a Salesman at the fictitious "Opa-Locka Dinner Theater." Opa-locka is mentioned in the 1995 action movie The Substitute by a black student who is being disciplined by Tom Berenger. The sequence in Goldfinger where CIA agent Felix Leiter is tailing Oddjob, who is driving Mr. Solo to the airport, was filmed in Opa-Locka. ^ "UNITED STATES QuickFacts from the US Census Bureau". Quickfacts.census.gov. Archived from the original on 2015-12-08. Retrieved 2016-07-26. ^ Miller, Mark; Raterman, David (2008). National Geographic Traveler: Miami & the Keys. National Geographic Books. p. 66. Nijman, Jan (2010). Miami: mistress of the Americas. University of Pennsylvania Press. p. 27. ISBN 0812207025. ^ "Opa-locka - Town a 'Dream' Come to Life". MiamiHerald.com. Retrieved 2 September 2008. ^ "History of Opa-locka Architecture". Opa-locka Community Development Commission. Retrieved 2 September 2008. ^ Moriaty, William (November 24–30, 2003). "The History of Aviation in Florida". Crazedfanboy.com. La Floridiana. Retrieved 8 April 2006. ^ Miller, Alicia Momsen. "From Rio to Akron aboard the Graf Zeppelin, 1933". Archived from the original on 12 February 2003. Retrieved 8 April 2006. ^ Chardy, Alfonso. ""Opa-locka field was once the site of secret CIA base", Miami Herald, 20 April 2013". Retrieved 5 April 2018. ^ Gleichauf, Justin F. ""Keeping Up on Cuba: A Listening Post in Miami," CIA Library, Center for the Study of Intelligence - Studies Archive Indexes. Vol44,No5, 08 May 2007". Retrieved 5 April 2018. ^ a b "City of Opa-locka History". OpalockaFL.gov. City of Opa-Locka, Florida. ^ Sallahand, Michael (2016-06-01). "Governor declares financial emergency in Opa-locka". Miami Herald. Retrieved 2016-07-26. ^ Rabin, Charles (2016-05-24). "Facing bribery charges, Opa-locka commissioner rams SUV into tree, killing himself". Miami Herald. Retrieved 2016-07-26. ^ Maselli, Giovanna (2016-06-10). "Gov. Scott Names Members In Opa-Locka Financial Emergency Board « CBS Miami". Miami.cbslocal.com. Retrieved 2016-07-26. ^ "MLA Data Center Results of Opa-locka, Florida". Modern Language Association. Retrieved 2007-10-29. ^ Sallah, Michael; Weaver, Jay (17 September 2016). "Opa-locka spent millions on parties, pet projects, bonuses; ignored warnings of financial collapse". Miami Herald. Retrieved 19 September 2016. ^ Weaver, Jay; Sallah, Michael (12 September 2016). "Former Opa-locka city manager pleads guilty in corruption probe". Miami herald. Retrieved 19 September 2016. ^ Sallah, Michael; Weaver, Jay (31 August 2016). "Steeped in scandal and debt, Opa-locka hands over water billing to county". Miami Herald. Retrieved 19 September 2016. ^ Garcia-Roberts, Gus. "The Curse." Miami New Times. February 10, 2009. 2. Retrieved on February 11, 2009. ^ a b Godfrey, Calvin. "Opa-locka Boots the Boss." Miami New Times. January 30, 2008. 1. Retrieved on September 28, 2009. ^ "Opa Locka Crime Rate Report (Florida)". Retrieved 8 May 2013. ^ "DR. ROBERT B. INGRAM ELEMENTARY SCHOOL." Miami-Dade County Public Schools. Retrieved on April 25, 2013. ^ "NORTH DADE MS." Miami-Dade County Public Schools. Retrieved on April 25, 2013. ^ "HIALEAH-MIAMI LAKES SHS." Miami-Dade County Public Schools. Retrieved on April 25, 2013. ^ http://www.mdpls.org/branches/opa-locka-branch-library.html.Miami-Dade Public Library System Retrieved on April 18, 2016. ^ Musibay, Oscar. "God Damned." Miami New Times. 1. May 30, 1996. Retrieved on September 28, 2009. Wikimedia Commons has media related to Opa-locka, Florida.